One of the most important things you can do in writing non-fiction is to ensure your readers are not surprised or bewildered by what they encounter as they read along in your content. Good introductions help readers focus on what matters in your examples and figures and so forth, so they take away the points that you want them to grasp. Anything not body text should be given a specific introduction before it occurs. Sections and chapters should be introduced at their very beginning. Readers otherwise are easily confused, failing to comprehend what they are reading, and missing the points that you're wanting them to take away. Example 1 illustrates the problem by showing introductions gone wrong and gone missing. Read through it. Think about whether you comprehend what's being said. Why is the list present? What does it convey? What are the purposes of the two images? Magic colors in the sky! Children and adults alike pause to look in wonder when weather conditions cooperate to produce a rainbow. A good show will see traffic stopping and busy adults reverting to childlike wonder as they gaze up at the colored spectacle unfolding in the sky above. Unknown photographer. Courtesy of the National weather service. (Source Link). Photo by Wade Bell. Courtesy of the National Weather Service. (Source Link). The term Parhelia is never introduced, so many won't grasp what the topic is about. Paragraph 1 contradicts the heading by giving the impression the topic is about rainbows. Your brain isn't told how to file away the information given in the bulleted list. Nothing tells you the reason why the photos are being shown. Nor are the photos labeled so that you know what you are looking at. Just a little attention given to properly introducing topic, terms, and elements not in the body text makes a world of difference. Read Example 2 and see how much clearer it is due to my supplying the needed introductions. Magic colors in the sky! The term parhelia refers to the appearance in the sky of two bright spots leading and trailing the sun's motion. These bright spots are often accompanied by a halo of light and a display of color resembling a rainbow, but from a slightly different cause. Parhelia are distinguished from rainbows by their cause. Rainbows like you see in Figure 1 are caused by sunlight striking against water droplets, and typically a rainbow forms after a storm has passed. 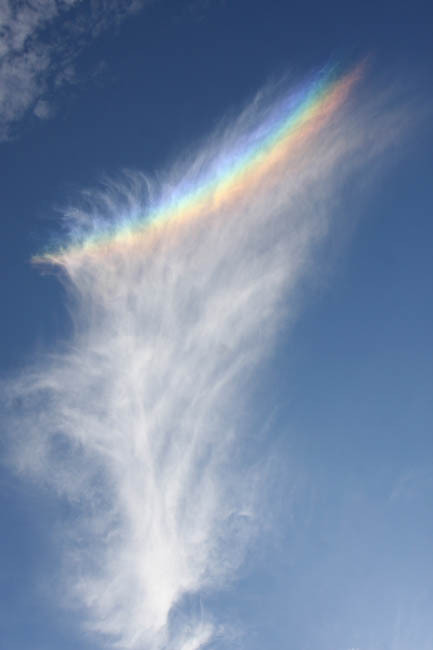 Parhelia are caused by sunlight striking against ice crystals in the atmosphere. Clouds may be involved. Figure 2 shows a particularly striking Parhelion seen from Crawford County, Indiana in 2010. Figure 1. A rainbow formed by sunlight striking water droplets. Unknown photographer. Courtesy of the National weather service. (Source Link). Figure 2. A sundog formed by sunlight striking ice crystals. Photo by Wade Bell. Courtesy of the National Weather Service. (Source Link). Isn't Example 2 much clearer and more informative? Notice how I took pains early in Paragraph 1 to define the term Parhelia that is likely to be unfamiliar to most readers. I did have to sacrifice my colorful prose about children and adults looking up in wonder in order to move immediately into introducing the term, and that's OK. Don't become so attached to a flowery-sounding passage of text that you refuse to improve your writing by throwing out that passage and replacing it with one that gets to the point and helps readers grasp the topic at hand. Write a specific introduction to each element in your content that is not body text. What I'm talking about here are figures, lists, examples, tables, diagrams, images, quotations, anything that is not a normal paragraph of text. Tell readers what an element is, so they can know what they are looking at. Tell them why you are showing it, so they know what point you want them to take away. There are many colloquial names for the phenomenon. Some of the more common ones are given in the following list. Also know that the term parhelion is the singular of parhelia. Never write a lead-in sentence for a numbered element. Instead, introduce numbered elements from a normal sentence by citing their number as I do in Example 2. It's fine for an introduction to a numbered element to occur at the end of a paragraph preceding the element itself, but never end that sentence in a colon. This rule is partly because numbered elements get moved around during page layout, and partly because your mentioning the number is what identifies the element, making the colon unnecessary and possibly confusing. Tip: Read my post on Effective Listing for additional tips on writing good introductions to different types of lists that are commonly used in technical writing. Always begin a section with a strong lead paragraph designed to draw readers into your topic. Don't leave readers guessing! The way to draw readers in is not to hide your topic and surprise them later. There's no doubt as to the topic at hand. Telling a reader your point or topic up front helps their brain in its work of organizing and storing the information you're imparting. Note: Paragraphs don't need introductions of course, but make their first sentences good ones. Get to the point. My first "sentence" in Example 2's lead is really an exclamation. My first real sentence gets right to the point by stating the topic at hand. What comes next elaborates on that clear and simple statement. You may find that you need two or three paragraphs to introduce a book chapter or a particularly large and substantial section. My opinion is that if you're writing more than three, that you're either not summarizing well, or you're not organizing your content well. Tip: Read my post Headings and Subheadings and Why One is the Wrongliest Number for some additional examples of good introductions to sections in non-fiction writing. Let your body text carry the weight of your writing. Other elements enhance your writing, but your text should carry the weight and the momentum. One test I like to make is to read a section or a chapter to see whether I can follow the gist of the discussion by looking just on the body text, without looking at any of the other elements such as images and lists. Good introductions mean that I'll be aware of other elements without seeing them, and that I'll understand why those elements are being shown and what the author intends for the reader to draw from them. And that's good writing! Thanks to Tom Reaugh, Lead Forecaster, National Weather Service, Louisville, for his generous help in answering questions about permissions, and for sending along copies of the images used in this article. Thanks to Wade Bell for capturing such a wonderful shot of a "sundog" and agreeing to let me show that image in this article and its example.